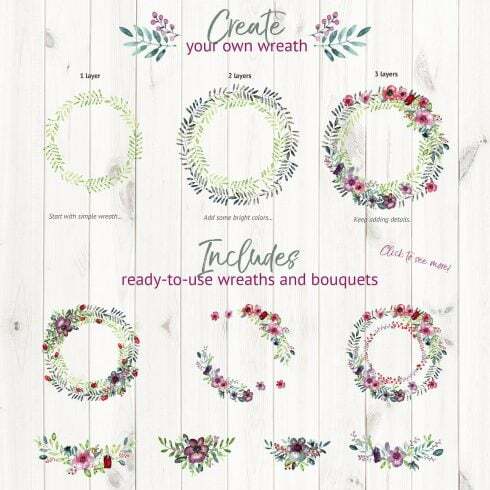 We are glad to present you Heartsease Wreath Creator. It includes hand painted floral elements, created with gentle shades of watercolor. Adobe Photoshop and Adobe Illustrator CS4 or newer are required! BUT if you don’t have them, zip file includes each layer in PNG for designing in your favorite editing software! Also a basic knowledge of layers is required. Turn on and off layers to find a nice view! 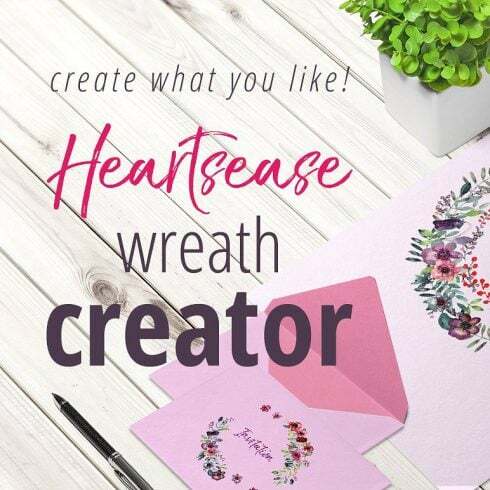 7 individual layers used in Heartsease Wreath Creator in PNG – you can use them for designing in your favorite editing software! All files are supplied in 5000x5000px with 600 DPI. Can an artist draw any image from a blank canvas? Generally, yes. Should he? It’s counterproductive, takes too much unnecessary time. For this reason most of the web designers make use of pre-made graphics components – combine them, adjust them and develop the design . It is actually pointless to buy these components as a stand alone, so that is exactly why they are put into graphic packages and offered for sale as a single product. The way to spend significantly less bucks on MasterBundles items? Are you looking for a 5% additional price reduction on any package from MasterBundles? Well, it is not that hard. All you have to do is merely share the web page with a bundle on social network (Facebook). When completed, the price reduction will be immediately included in your shopping cart. The collections of components accumulated into a graphics bundle deal are usually sorted as outlined by their type or main objective. There could be packages with infographics, icons, business card templates, wedding invitation templates or mockups, etc. On top of that, you will also manage to find graphic bundles specifically for Halloween, St. Valentine’s Day or Christmas. For what reason are graphic packages highly profitable? The advantages of graphic bundle deals for web designers are usually quite evident. But if you are new to those elements and now have questions, the subsequent info will probably be of great help for you. Including a multitude of the elements within a single package, the collection gives you an opportunity to use different of them for many different tasks. Besides, the price is often cut down tremendously which lets you stretch your budget, yet get the whole set valued for hundreds of dollars. Any other bundles on MasterBundles.com? MasterBundles.com could offer you a big selection of different bundles. MasterBundles.com sells not only graphics packages but additionally roughly 20 other various kinds of goods. Fonts, WordPress themes, mockups, icons, photos, illustrations, presentation templates and a whole lot more – on the MasterBundles it is possible to locate most of the items, required for a design project development. The watercolor bundle is found to be the lovliest innovation in design. Handcrafted by painters on the a piece of paper, the wonderful pictures get digitized and included in a package as design templates for projects. Watercolor elements are just great for DIY, blogs, quotes, greeting cards, posters and wedding invitations. All of the drawings are highly detailed and prepared for print or digital use. One more bundle also suitable for photographers as well belongs to photo bundles. Here you’ll discover a bulk of solutions for photo retouching. If you want Lightroom presets, photo overlays, PS actions, or any other resources for working with photographs, you have come to the absolute right place. Precisely what is Instagram templates bundles? Living in the online age, many of us devote half our everyday life within social media platforms like Instagram. No matter what purpose we strive to achieve using this platform, we want to be noticeable in a crowd among a large number of identical profiles. With premium Instagram design templates offered at MasterBundles.com, you don’t need to devote eternity while building the outstanding appearance of your page. One of the bundle deals will certainly help you highlight the aesthetic appearance of your Instagram profile. If you need infographics for a future presentation in different market sectors through social media and advertising and marketing to medicine and education, the bundle is just the thing you have been looking for. Making use of the infographics bundle you’ll find yourself saving your time which can be essential with regards to performance efficiency. Each element comes in an independent file which can be modified in Powerpoint, Keynote, Photoshop or Illustrator. MasterBundles.com is a website that gathers top offers from around the internet and lets you buy the elements you’ll need in your business for for less money. Bundle deals this fabulous website markets are limited in time, and that’s the reason why they are so low-cost. MasterBundles.com also has a big blog with the useful design features explained.